The Gift of Health: Many of us nurtured in North America we have come to know health care as a given. Our ready access to medical care has minimizes trauma of birth and the challenges of the early years. If we have the opportunity to parent, we quickly recognize our greatest gift and greatest resource is our children. Over 100 global grants last year directly supported maternal and child health---- so many of the other areas of focus for global grants are also indirectly related to supporting our most vulnerable populations. I have included a brief video message (in song!) 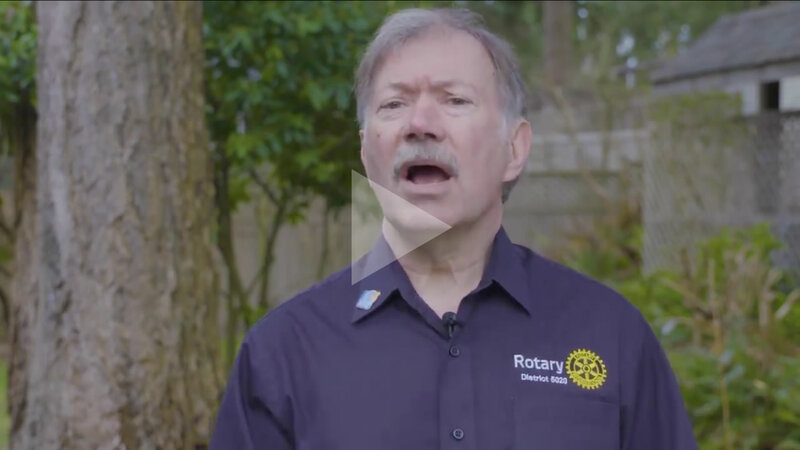 this month---in an effort to draw together so much of who we are and what we do as Rotarians. It is my dream to see every Rotary in District 5020 contribute a minimum of $25.00 U.S. to the Foundation. Please help our District 5020 raise its per capita Annual Fund giving this year----and continue to truly leave a collective imprint on our world. Thank you for your life decision to be a Rotarian. Together we inspire; together we connect; together we can leave a legacy! Al Brooks Foundation Dinner in Olympia.